An Integrated Building Management System (IBMS) from Messung is a single comprehensive Building Management System for the integration of HVAC, Fire Alarm, Public Address, Access Control, Security, Lighting and other systems. Messung IBMS brings the benefit of better indoor comfort, energy efficiency, safety and security, and most importantly better management of all systems under the unified platform. The overall system architecture comprises of the following logical layers. 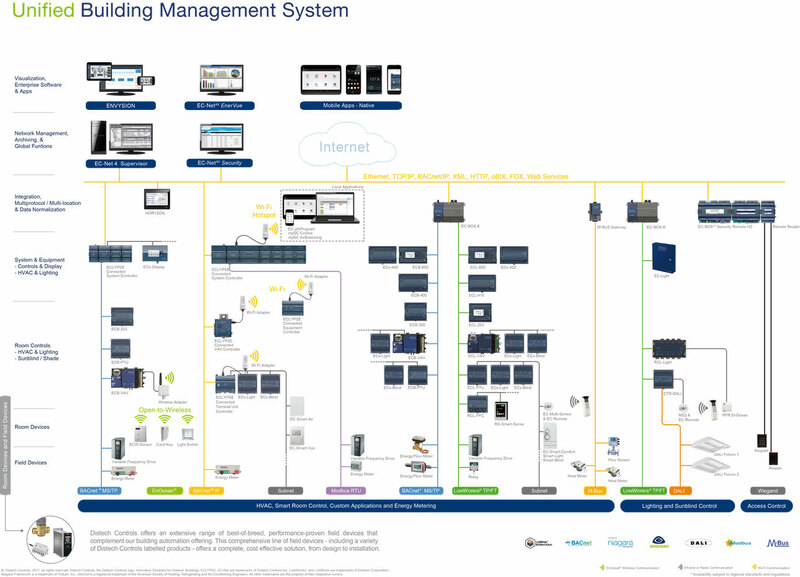 Management Layer for system monitoring, controlling, data storage and reporting. Control Layer for intelligence of the systems. Field Layer for sensing, controlling and protecting environmental conditions. Distech Building Management System (BMS) platform, powered by Niagara Framework®, is a multi-protocol, multi-function capabilities provide seamless and intelligent controls of HVAC along with integration of energy meters, VFD, DG Set, Chillers, UPS, PAC, WTP etc. BMS supports a wide range of protocols including LONWORKS®, BACnet®, Modbus® and Internet standards. It provides the power to do more, with cost-effective and scalable integration of all your control, monitoring, and operational needs. A truly open solution, the platform creates a sustainable foundation that supports and evolves with your building system’s lifecycle. Fire Alarm System (FAS) helps to ensure employee safety and the overall welfare of a business through detection and announcement to the occupants by guiding safe egress routes during the situation of distress. Addressable Intelligent Fire Alarm System from Messung consists of detectors and devices wired in loop, each with unique ID and location. These devices are directly connected to central intelligent fire alarm control panel that monitors the functionality and status of each device programmed in the system. In the event of fire, these devices detect smoke, heat etc and help to generate audio and visual alarms as well as guide safe egress route. IP based fire alarm system when integrated with BMS can provide further safety and interlocks to safe guard human and equipment like park elevators, open access doors, activate pressurization and exhaust fans, safe control of HVAC equipment etc. CCTV technology has evolved exponentially from simple video footage monitoring to today’s intelligent systems that are capable of identifying abnormal events or behaviors. The system is comprised of a network of security cameras and collective functions and monitors from video feeds on an internal system of monitors. CCTV surveillance systems are more often used to monitor large areas such as retail stores, hospitals, datacenters, banks as well as public spaces like airports and metro stations. High resolution, remote access, redundant storage and wireless. High scalability, NVR redundancy and high coverage area. Powerful analytics, virtual unlimited clients and large video wall for all feeds. Modern Access Control System (ACS) helps to protect people and assets by controlling access to work area through smart systems. It allows access to legitimate visitors and also records their movements. Open security doors in the event of fire. Record CCTV footage in case of burglar alarm or intruder alarm. Generate report on personnel tracking. Public Address System (PAS) plays an important role in safe management of buildings. The voice messages guide the occupants what to do in case of emergency. People are most likely to follow the voice command to take the correct action during an evacuation. PAS from Messung is an advanced IP based system consisting of digital controllers/ router, powerful mixing amplifiers, stylish call stations and different type of high-quality speakers. It provides flexibility to interface standard music player and dry contacts from other systems like fire alarm. Touch screen graphical user interface manages complete system. Some of the important subsystems of an IBMS required specially for some of the applications like datacenter, large document storage, etc. are as below. Messung is strategically associated with global vendors of above systems for the integration.